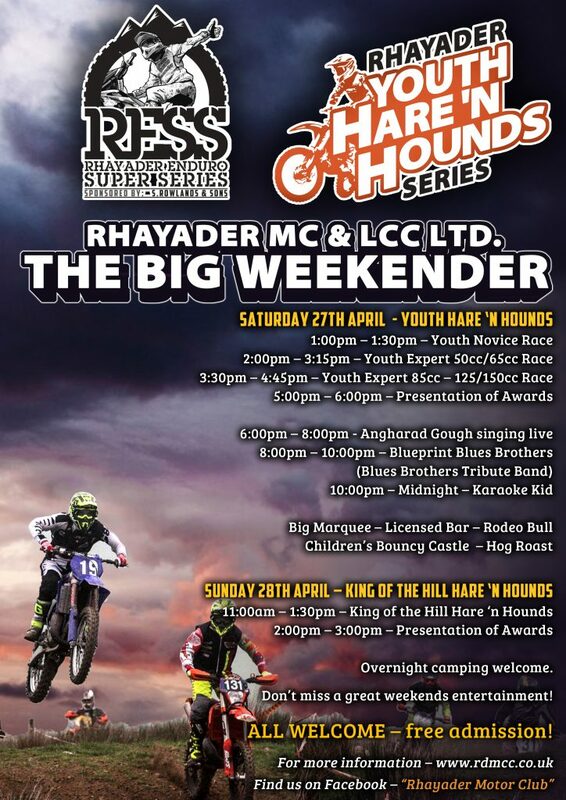 Round 1 of our Youth Hare ‘n Hounds Series will take place at Cwmythig Hill, near Rhayader on Saturday 27th April. The event will start at 1pm. We will have classes for Auto/50cc, 65cc, 85cc small wheel, 85cc big wheel, 125cc/150cc & Fun Bikes. 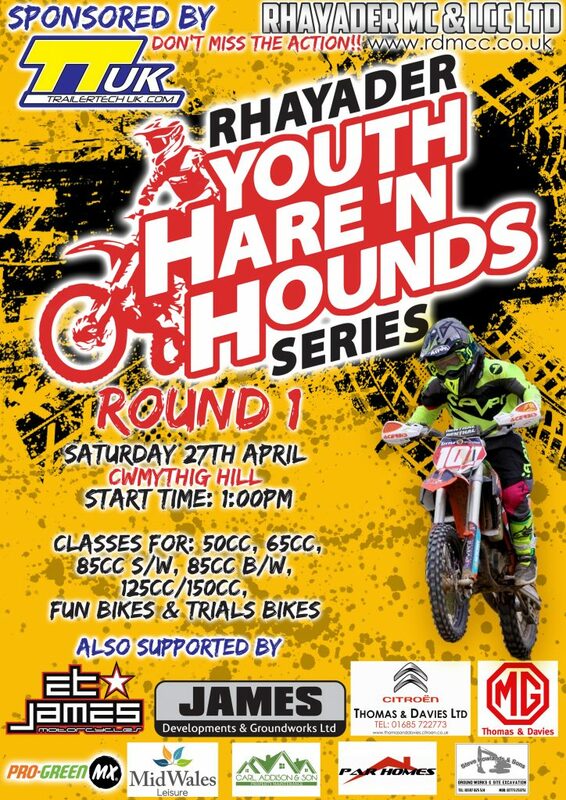 Group 1 – Novice/Beginners Race (30 minutes) – classes for: 50cc, 50cc Fun Bike, 65cc, 85cc, Open, Trials Bike & Fun Bike – (30 minutes). The route for this will be an easy/enjoyable lap ideal for novices/beginners. Group 2 – Expert Race A – classes: 50cc & 65cc (1 hour 15 minutes). This will be a more challenging & longer lap than the Novice/Beginners group. Group 3 – Expert Race B – classes: 85cc small wheel, 85cc big wheel, 125cc/150cc & Fun Bike (1 hour 15 minutes). This will be a similar lap to the previous group but will have a few extra sections thrown in to make a slightly longer lap. There will be a “presentation of awards” in the marquee after the final race of the day. Awards will be presented to the top 3 in each class, & medals for all finishers. Marquee – Licensed Bar – Angharad Gough singing live during the Saturday evening, so why not stay around & join us for a party! We also have an Adult Hare ‘n Hounds (minimum age 15) on the Sunday, classes for all abilities. For more information on this event – click here. You will need to fill out an entry form & pay for your entry (with cash) at signing-on. Entry Fee for the Novice Race is £30, while for the Main (Expert) Races is £35. There will be a “Pit Area” at the start of the lap where riders will be able to pull in for fuel/drinks etc during the race. Please make sure engines are turned off during fuelling. Riders will start in their respective class (50cc, 65cc …..etc), with approx. 20/30 second intervals between each group. Riders will be allowed to warm their engines before the start, the race will start with engines running. Depending on the weather & track conditions, we might allow riders to have a 1 lap practice/sighting lap slowly following a marshall (this is nor Novice Race only). Numbers need to be on ALL panels, numbers will be available at singing-on. Numbers need to be clear, for lap scoring. Riders are required to wear a Helmet, Goggles, Boots, Gloves as minimum protection, it is advised riders use chest guards, knee guards, neck braces etc for their own safety.